River City – Bousfields Inc.
Bousfields was retained by Urban Capital to be part of the team developing the River City project, located on the northeast portion of the West Don Lands and fronting onto the planned Don River Park. 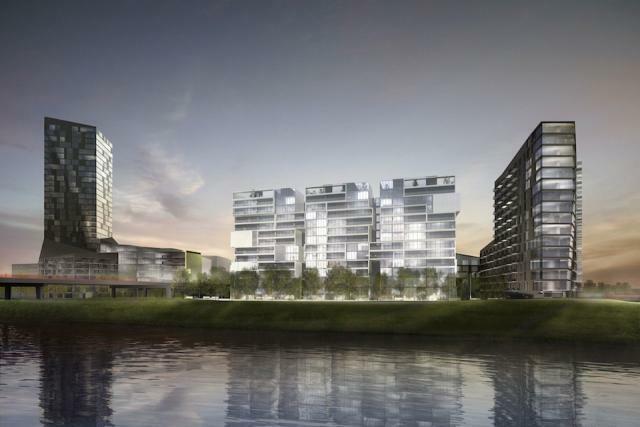 The River City project is an award-winning, multi-phase development, which upon full build-out will be comprised of five mixed-use and residential buildings on four development blocks. The project will be one of the first developments in the West Don Lands neighbourhood. Both Waterfront Toronto and the Waterfront Toronto Design Review Panel have unanimously endorsed the project. Bousfields was specifically been retained to prepare and support applications for Minor Variances and Site Plan Approval to allow the project to proceed. Bousfields has been responsible for the ongoing liaison with the applicant, the City, Waterfront Toronto, and the consulting team which includes Saucier + Perrotte Architectes, ZAS architects and The Planning Partnership. Phase 1 of the development was granted Site Plan Approval in May 2012. Residents are currently occupying the first building of the first phase and the second building is near final completion. The Site Plan Approval application for Phase 2 is currently under review by City staff. Approvals are anticipated in mid 2013. Preliminary designs have commenced for Phase 3 of the project.